Tonight is Rosh Hashanah, the Jewish New Year which is celebrated with a big meal, like many holidays. I particularly enjoy cooking for Rosh Hashanah because it gives me an excuse to indulge my significant sweet tooth. To start the year off right and increase the chances that it will be a prosperous year, the meal has to be filled with sweet dishes, especially apples and honey. The traditional dessert is a honey cake and I’m going to try to make it for the first time tonight. But as an alternative, I’ll also be serving this Fat Lady Peach Cake, a sweet yet light creation that showcases the last of this summer’s glorious peaches. It actually reminds me of a clafouti, served warm, it dissolves in the mouth, leaving just a hint of sweetness on the tongue. I was inspired to make this cake after seeing Steven Fries, columnist for the New Haven Register, prepare it for a TV segment on Connecticut Style. I met Steve at the Pillsbury Bake Off, and really enjoyed getting to know him and his partner Chris Barrett, one of my favorite people on Twitter. Steve got the recipe from the Fat Lady Cookbook and serves it doubled. I’m not sure which dessert will win tonight after we finish our brisket and carrot souffle. If all goes well, it will be a tie and everyone will go home, happy and full, sure that the next year will indeed by a good one. Thinly slice peaches and toss with lemon juice in a bowl, set aside. In another bowl cream butter and 1 cup sugar until fluffy. Add eggs and vanilla and beat well with electric mixer. Sift flour, salt and baking powder and add to mixture. Put into well greased 8 in spring-form pan. Place peaches on top and sprinkle with vanilla sugar or, if you can get your hands on it, the wonderfully named Gluttony butterscotch and sugar grinder. I found mine at the Chelsea Market – and there was no chance I would resist it. In a pre-heated 350 degree oven bake 45 minutes to one hour until toothpick comes out clean. >May have to give this a try since it is supposed to be baking weather. Thank you for sharing. Wishing you and your family a Happy and Sweet New Year. >I have the last six peaches on my table, begging to become a Fat Lady Cake. Can't wait to try this deliciousness. L'Shana Tova! 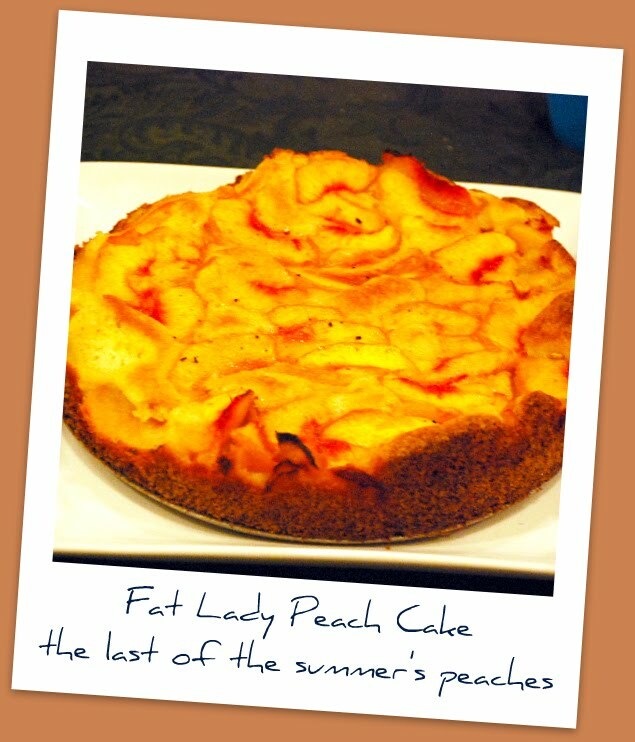 I found Fat Lady Peach Cake recipe in New Haven Register in 2010 ,July 4th. Left out 2 ingredients, how much flour and what kind of cream and how much. Very eager to make the cake. Peaches are getting very ripe off tree. Called twice haven’t gotten answer. My email is sharontylinski@gmail.com. You can email the recipe or send a copy to Sharon Tylinski, 44!CornerstonenDr ., Derby, Ct. 06418-1146. Very disappointed haven’t gotten answer. Hope to come up with some friends in the Fall.